Benzodiazepines, a class of drugs frequently prescribed for anxiety and insomnia, is not often the first choice for those looking for a high. These drugs tend to not be powerful enough. This brings about a dangerous kind of practice, however – the practice of mixing benzodiazepines and alcohol. Valium with whiskey or Xanax with beer are popular combinations. Taken together, these substances can combine to form a powerful, and often dangerous, effect. The effects on the central nervous system of mixing benzodiazepines and alcohol can be unpredictable. Some effects are routinely seen, however. They occur in nearly everyone who tries it. Unsteady motor skills, mood swings, and cognitive deterioration are all common symptoms. In some people, however, the effects are much worse. Since each of these substances is able to amplify the effect of the other, fatal overdoses are a far greater risk. So are instances of loss of consciousness. It has happened in many high-profile cases — a benzos and alcohol blackout was implicated in Whitney Houston’s death. With combinations of benzodiazepines and alcohol interaction is a clear possibility. It happens because both substances act as central nervous system depressants. As alcohol causes relaxation and slows down metabolism, benzodiazepines are allowed a deeper range of action. Not only can intoxication rise to far greater levels than when either substance on its own, cardiac and respiratory function tend to slow down to life-threatening levels, as well. Mixing benzodiazepines and alcohol can amplify pleasure; it comes from a greater effect on the brain. There is a greater risk of addiction. Even worse, treatment of such addiction can be far more challenging. 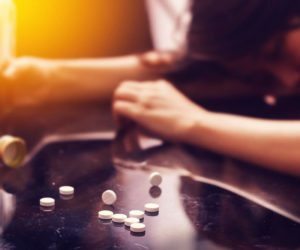 In detox, combination addictions to multiple substances usually result in unpredictable withdrawal symptoms that are difficult to treat on an outpatient basis. Inpatient treatment may become essential to mitigate risks. Whether it is a combination of sleeping pills and alcohol, or anxiolytics and alcohol, these substances do need to filter into the bloodstream through the liver, a process that can put this vital organ at risk of injury. Those who mix-and-match benzodiazepines and alcohol often raise their risk of exposure to liver disease. It can be hard to change your mind on the basis of information that comes from a short introduction. If you have questions about using these substances together, it’s always a good idea to speak to a professional. An addiction professional would be more helpful than a physician. Addiction to both benzodiazepines and alcohol comes with an added level of complexity. It is usually best to seek out a rehab with specific expertise in such combinations of drugs. Specific expertise is always important with addiction treatment. Finding such rehab skills requires a thorough research of the options available. WhiteSands Treatment offers both the expertise and experience in such twin addictions. With both addiction experts and therapists skilled in the challenges involved, it offers one of the best choices for evidence-based rehab for those struggling with dual addictions. If you would like to speak to an expert about the options available, all you need to do is to call (877) 855-3470 now. ← Can Someone Have an Allergic Reaction to Meth?